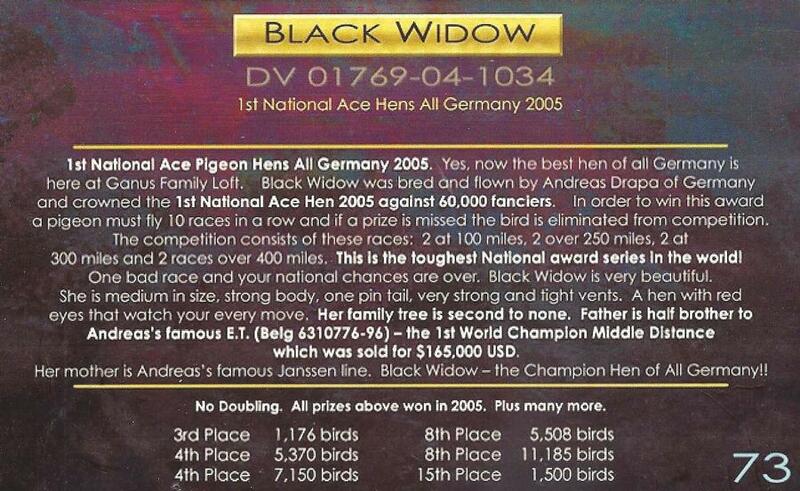 18 WEYER 287 BLK DOUBLE INBRED G/DTR OF "BLACK WIDOW" 1ST NAT'L ACE HEN ALL GERMANY VS 60,000. 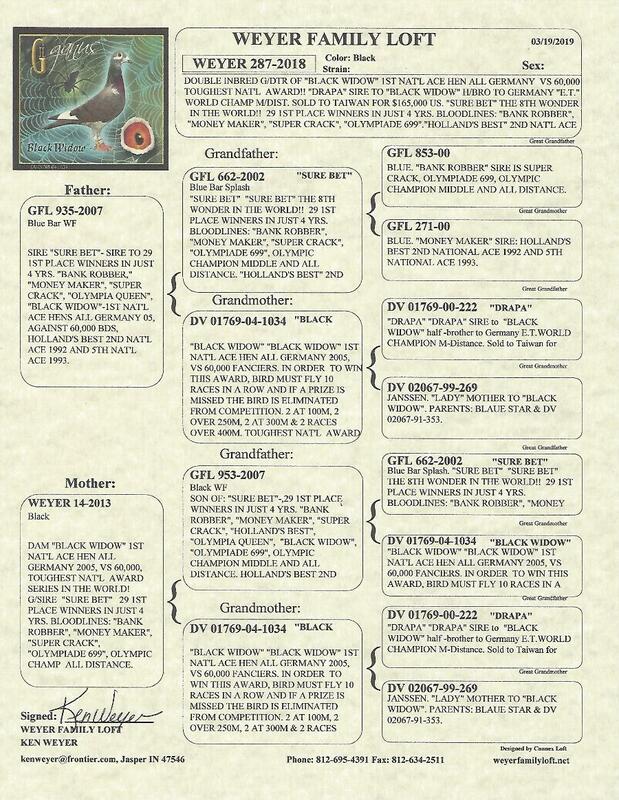 18 WEYER 287 BLK DOUBLE INBRED G/DTR OF "BLACK WIDOW" 1ST NAT'L ACE HEN ALL GERMANY VS 60,000. "DRAPA" SIRE TO "BLACK WIDOW" H/BRO TO GERMANY "E.T." WORLD CHAMP M/DIST. SOLD TO TAIWAN FOR $165,000 US. 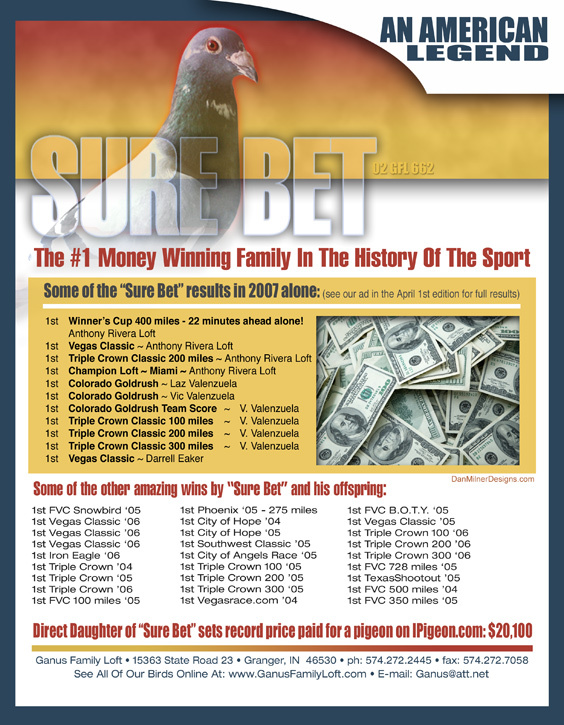 "SURE BET" THE 8TH WONDER IN THE WORLD!! 29 1ST PLACE WINNERS IN JUST 4 YRS. BLOODLINES: "BANK ROBBER", "MONEY MAKER", "SUPER CRACK", "OLYMPIADE 699", OLYMPIC CHAMPION MIDDLE AND ALL DISTANCE. "HOLLAND'S BEST" 2ND NAT'L ACE 1992 & 5TH NAT'L ACE 1993. BLOODLINES OF WINNERS!!! "BLACK WIDOW" 1ST NAT'L ACE HEN ALL GERMANY 2005, VS 60,000 FANCIERS. 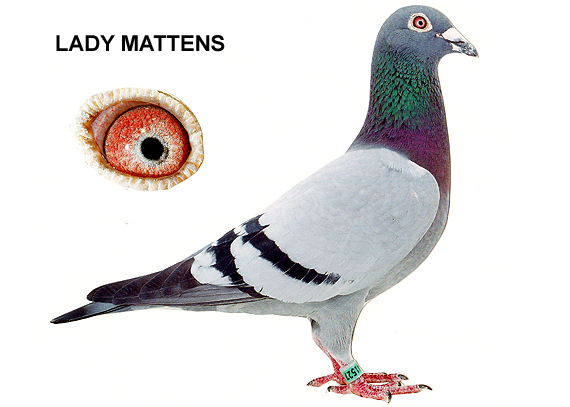 IN ORDER TO WIN THIS AWARD, BIRD MUST FLY 10 RACES IN A ROW AND IF A PRIZE IS MISSED THE BIRD IS ELIMINATED FROM COMPETITION. 2 AT 100M, 2 OVER 250M, 2 AT 300M & 2 RACES OVER 400M. TOUGHEST NAT’L AWARD SERIES IN THE WORLD! "DRAPA" SIRE to “BLACK WIDOW" half -brother to Germany E.T.WORLD CHAMPION M-Distance. Sold to Taiwan for $165,000 US dollars. PARENTS: OLYMPIASIEGER & DV 09468-97-278. 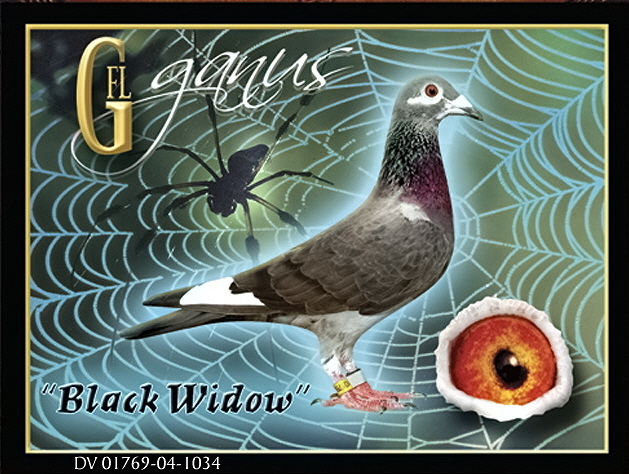 “BLACK WIDOW” BLOOD IS PRODUCING TOP RESULTS FOR MANY RACERS THROUGHOUT THE USA. WE GET CALLS AND E-MAILS FROM RACERS THAT ARE VERY HAPPY WITH THIS BLOODLINE! !.